OTTAWA — It’s been a long time since the Ottawa Senators have been able to savor the momentum that comes from stringing together a pair of wins. Mika Zibanejad, Kyle Turris and Clarke MacArthur scored goals, and Craig Anderson made 34 saves to lead Ottawa to a 3-1 victory against the Washington Capitals on Monday. 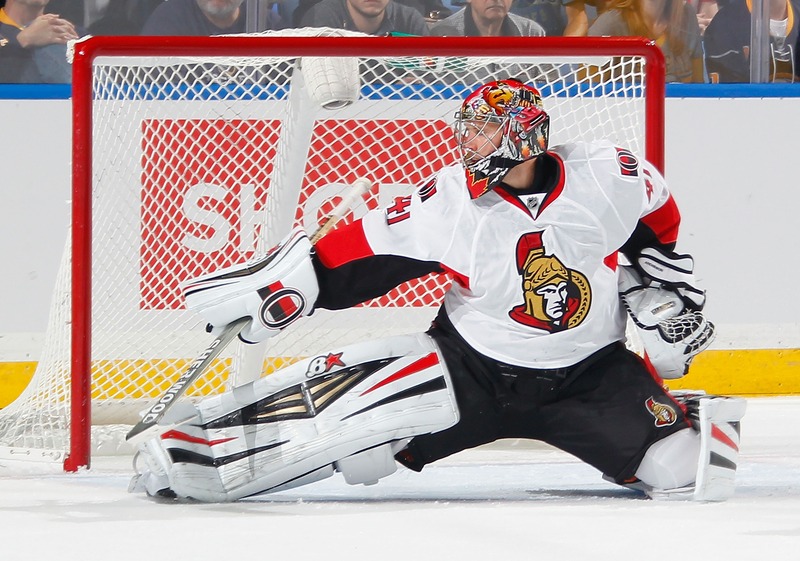 The win gave the Senators consecutive victories for the first time in seven weeks. Zibanejad drew Ottawa even at 13:49 of the first period with his first goal in 13 games. Turris scored his third goal in the past five games at 3:14 of the second to give the Senators a 2-1 lead. The Senators, who defeated the Boston Bruins 4-3 on Saturday, won consecutive games for just the third time this season. Ottawa’s most-recent winning streak was a season-high three-game run from Nov. 5-9. The Senators had failed to win the next game following a victory eight times in a row prior to Monday. Anderson, who got a glove on Eric Fehr’s shot from the slot with a little more than 2 minutes left in the third to preserve Ottawa’s lead, made several big stops during an offensive push by Washington late in the second period, beginning with a save on Mikhail Grabovski’s shot on a 2-on-1 and capped moments later when he denied Alex Ovechkin’s backhand as the Capitals captain drove the net. “When you make the goalie hot, he’s going to play hot,” said Ovechkin, who leads the NHL with 30 goals but failed to record a point for a fourth straight game. It is the longest Ovechkin has been held without a point since a four-game stretch from Nov. 12-19, 2011. Joel Ward scored his 12th goal 2:11 into the game to put Washington ahead 1-0. Capitals goalie Philipp Grubauer made 35 saves in his fourth straight start. The 22-year-old German rookie, who is 1-2-1 over that stretch, stopped 16 of 17 shots and five of six shootout attempts in a 2-1 loss to the Buffalo Sabres on Sunday. Senators right wing Chris Neil left the game after colliding with Ovechkin midway through the first period. Neil, who was favoring his left leg as he skated off the ice, sustained a lower-body injury and did not return. Neil, who leads Ottawa with 99 penalty minutes, has five goals and one assist in 42 games. Ovechkin was upset about the hit. Ottawa captain Jason Spezza and defenseman Chris Phillips, an alternate captain along with Neil, have sat out the past two games due to injuries. Spezza is day-to-day with a lower-body injury. Phillips has a left-foot injury. Zibanejad, who has moved to center in Spezza’s absence, took a return pass from Cory Conacher on a 2-on-1 and steered the puck into a wide-open net for his ninth goal; it was his first since Dec. 1. “I thought he was going to shoot it first, but then he kind of held onto it, so I put my stick down just in case, and I couldn’t have asked for a better pass than that,” Zibanejad said. Senators right wing Eric Condra fired a shot off the right post in the opening minute of the second period. Bobby Ryan, who scored his team-leading 18th goal Saturday, got his 18th assist on Turris’ 10th goal at 3:14. Referee Jean Hebert put his right arm up to signal a delayed penalty on Capitals defenseman Mike Green, who hooked Turris as the Ottawa center drove the slot after receiving a pass from Ryan. Turris made the call a moot point when he deked around Grubauer to stuff a shot into a gaping net. Ward scored with his back to the net to give Washington the early lead. The Capitals forward’s backhand along the ice from the slot found its way into the net inside the left post. Anderson had a scare before his flurry of saves later in the second when he left his net to play Washington defenseman Karl Alzner’s dump-in along the glass. The puck struck a stanchion and hit the outside edge of the wide open net. Ottawa closes out its three-game homestand Thursday against the Winnipeg Jets. Washington returns home from its 0-1-1 road trip to face the Carolina Hurricanes on Thursday.